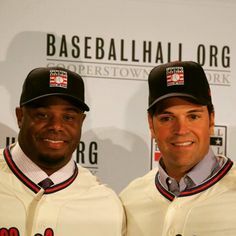 Mike Piazza and Ken Griffey Jr were inducted into the Baseball Hall of Fame on Sunday. The two superstars had very different paths to baseball greatness. Griffey Jr, was drafted #1 by the Seattle Mariners and became a prolific home run hitter. He ended his career with 630 home runs and 10 golden glove awards. As the son of an All-Star, Griffey was expected to be great, but fellow Hall of Famer, Mike Piazza followed a very different path. Piazza wasn’t taken until the 62nd round and very few believed he’d ever make it in the big leagues. As Piazza stated, “He had unique challenges, being a first-round pick. I had a unique challenge, being a last-round pick. There was pressure on him; there was pressure on me. Maybe a little different, or maybe nuanced a different way.” Griffey is the first Seattle Mariner to be induced into the Hall of Fame and Piazza is only the second New York Met to be inducted. In other (odd) baseball news, the Chicago White Sox pitcher, Chris Sale cut (using using a scissors) the Team’s throwback jerseys before the weekend game against the Detroit Tigers. He apparently didn’t like the look of them. Not surprisingly, he’s been suspended for 5 games. A few NBA superstars (including Curry, Lebron, Griffin and Harden) passed on going to the Olympics but Team USA will be tough to beat. They’ve completely destroyed every team on their exhibition tour and even when Kevin Durant and Draymond Green were booed in Los Angeles before a warm-up game with China, the players and Team weren’t fazed.